Life with a Wiener Dog: Joy with Bling! Welcome back! At least this little hiatus wasn't as long as they usually are! I was on such a card making roll last week until a terrible headache sidelined me. It started on Monday afternoon and didn't let up until Thursday afternoon. It was one of those where you don't want to have the lights on or any sounds to be made because your head hurts so badly. As soon as it was gone, I got busy stamping! I have a few cards to share with you. This is the first! One of the challenges I've missed doing a lot is the Merry Monday challenge. It's a Christmas Card challenge and if you do it every week, by the time Christmas rolls around, you'll have a bunch of Christmas cards. Well, if you're like me, you can also start in September and have some Christmas cards ready in December! This card is for Merry Monday Challenge #255 Joy which you can see here. As a bonus, I can now say I've officially started making Christmas cards for this year! I made my card with the word "joy" on it, first by stamping the phrase "to the world" diagonally over and over on my card base. If anyone knows a trick to doing this, I'd love to know it! I used my MISTI for the grid to help know where to start each line, but used a clear block with the stamp on it to actually stamp it over and over in Versamark Ink. This is a watermark ink that makes the stamp show up a little bit darker than the actual cardstock itself. I wanted my words to be evident, but I didn't want them to take away from the word "joy" in the center. 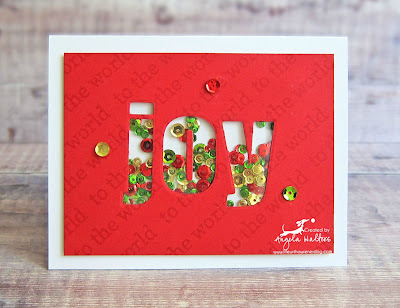 I used Altenew's Bold Alphabet Dies to cut the word joy out of my stamped card stock. I didn't have a snowflake that was the right size for my "o" so I just stuck with the real letter. To make sure they ended up perfectly, I used another piece of scrap card stock that was the same size as my original to measure and find the exact center. I arranged my letters and measured again to make sure they were still centered. They were, so I used washi tape to tape them to my sample piece. Then I ran it through the Big Shot. This was just one extra test to be sure they looked correct and were centered. I didn't want to stamp my background again, so I had to be very careful! My planning had worked, so I took the sample piece of card stock and put it right on top of my red stamped piece. I put the dies back in the sample piece, this time so they would cut the red stamped piece I had planned on using. I carefully put them in the Big Shot and thankfully, everything turned out great when I removed them! Next, I made my red piece of paper with the letters cut out of it into a shaker card. I attached a piece of acetate over the holes where I had cut my letters to make a window you could see through. I used foam tape all over the back of the red piece of card stock to make individual spaces around each letter to put the sequins inside and to make the whole piece the same height. I poured two different sizes of sequins into each letter. Then, I attached a piece of white card stock to the back where the letters were to hold the sequins inside so I could flip it over. Finally, I attached the entire red stamped shaker piece onto my white card stock base. I glued the center of the "o" back into place on the front of my acetate window. I also added three randomly placed sequins to the outside of the card. Christmas card number one was complete! I can cross it off of my Ta Da list and move on to card number two! I am also entering my Christmas card into two other challenges. This week, the Monday Simon Says Stamp Challenge here. I stamped a lot on my background so I believe my cards fit the bill! 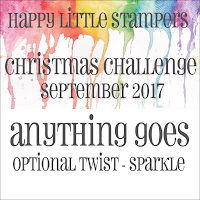 I am also entering it into the Happy Little Stampers Christmas Challenge September 2017 which you can see here. It's an anything goes challenge with the optional twist of sparkle and my sequins are pretty sparkly! Angela, this is such wonderful way to add your sentiment, and gorgeous way to bring JOY to someone's Christmas! LOVE your sweet joy card Miss Angela...so festive with all that wonderful holiday bling in your shaker! 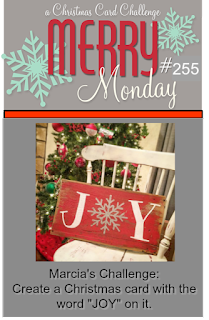 Thank you so much for playing along with us at Merry Monday Christmas Card Challenge! What a perfect card for our joy challenge! Thanks so much for playing Merry Monday with us this week!